The first Ukrainian FORUM of patients and physicians dedicated to blood clotting disorders was held on April 14, 2017. 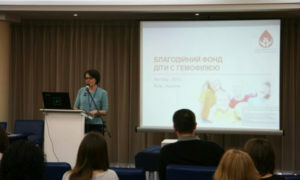 The FORUM was dedicated to the World Hemophilia Day. Each year, on April 17th the international community endeavours to bring more attention to patients with this rare and severe disease. 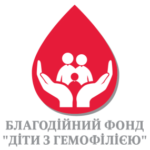 In 2017, the World Hemophilia Day was held under the slogan «Hear their voices«. These are voices of women and girls in our community who live with bleeding disorders or have someone with these problems and take care of them. 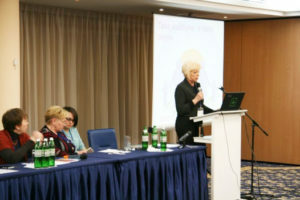 The FORUM of patients and doctors organized by the Charitable Foundation «Children with Hemophilia», the Association of Pediatric Hematologists and the National Pediatric Specialized Hospital “Okhmatdyt” is a platform where patients and doctors from different regions of Ukraine discussed current problems in the treatment and social integration of patients with blood clotting disorders, specifics of diseases for women and girls, psychological and social consequences of such diseases. In her welcoming speech Mrs. Svitlana Donska (CM, Head of the Center for Pediatric Oncohematology and Bone Market Transplantation of the National Pediatric Hospital “Okhmatdyt”), Chairman of the Association of Pediatric Oncohematologists of Ukraine of the National Pediatric Specialized Hospital “Okhmatdyt” stressed the need for a comprehensive approach to treatment and social adaptation of patients, told about modern hemostatic drugs, demand formation system and availability of vital medicines for patients in Ukraine. 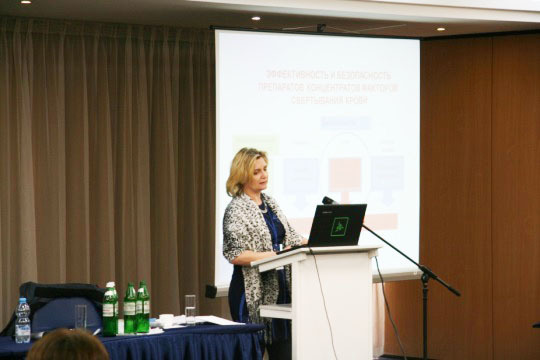 Mrs. Elena Mieshkova, Deputy Head Doctor of the National Pediatric Specialized Hospital “Okhmatdyt”, described the advantages of work in a multidisciplinary team of a multifield hospital and specifics of specialist training. Mrs. Kateryna Vilchevska, CM, Head of the Center for Homeostatic Pathologies of the National Pediatric Hospital Okhmatdyt, and Mrs. Viktoriya Yanovska, Head of the Ukrainian Reference Center for Clinical Laboratory Diagnosis and Metrology of the National Pediatric Specialized Hospital “Okhmatdyt” informed about current experience of examination and diagnosis of patients with hemophilia, inhibitory forms and von Willebrand disease, as well as practices in Ukraine. Mr. Leonid Dubei, Professor of the Department of Pediatrics of Danylo Halytsky National Medical University (Lviv) in his report described the main components of hemophilic arthropathy and the Canadian system of prehospital treatment – RRICES. 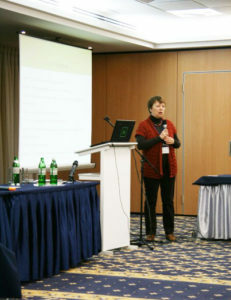 Mrs. Ludmila Marenych, chief freelance pediatric hematologist of Kharkiv, reported on hepatitis infections in medical facilities, their causes and prevention. The FORUM also addressed such important issues as psychological and social assistance to children with hemophilia and their families, psychological burnout syndrome and ways to overcome it, psychological preparation of mothers and children with hemophilia for medical procedures. High importance was placed on the report by Mr. Yuriy Bugai, representative of the project-office: «E health – overall system capabilities and needs of orphan patients». In the final part of the Forum Mrs. Natalia Kavardakova, freelance pediatric hematologist of Kyiv, highlighted the effectiveness and safety of treatment of patients with coagulopathies and summarized the results of the Forum. 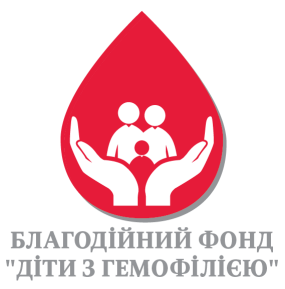 Mrs. Nina Astaforova-Yatsenko, Chairman of the Board of the Charitable Foundation Children with Hemophilia, told about the Foundation’s main projects realized in 2016 and forthcoming plans for 2017. After the Forum, a resolution on the necessary steps to enhance patient care was signed. The legislation of Ukraine on comprehensive approaches to treatment of orphan diseases, including hemophilia, is not perfect; therefore, treatment of hemophilia does not meet modern requirements and needs of patients. 1) The state of care for children with hemostatic disorders should be under control of the Ministry of Health of Ukraine. 2) In order to help children with hemostatic disorders under the State program 2301400 «Providing medical measures of individual state programs and comprehensive programmatic measures», a state registry with multilevel access of patients with hemophilia A, B, von Willebrand disease and other coagulopathies (for use by the Ministry of Health, State Healthcare agencies, physicians, and patients) should be created. 3) Provision of drugs for children with hemostatic disorders should be upgraded to the European level. 4) The National Pediatric Specialized Hospital “Okhmatdyt” should continue the development of care for patients with hemostatic disorders, primarily by organizing a 24-hour inpatient unit for monitoring of patients from different regions of the country and by establishing an algorithm of interaction of various hospital units to ensure effective care for children. 5) A joint interagency order to assist children with hemostatic disorders in the organization of medical, social, psychological and rehabilitation care in conjunction with the Ministry of Health, Ministry of Social Affairs, Ministry of Education and other departmental structures should be developed. 6) Development and implementation of standardized protocols of diagnosis, preventive care and urgent treatment, home treatment, rehabilitation and creation of a multidisciplinary team should be continued. 7) Cooperation with NGOs to raise awareness of patients and their relatives about medical, legal, legislative and educational aspects should be expanded. 8) An algorithm of psychological and social support for children, parents and their families should be developed.